24′ x 26′ Vertical Style Metal RV Carport with one 3′ panel on each side – Free Delivery & Free Installation! 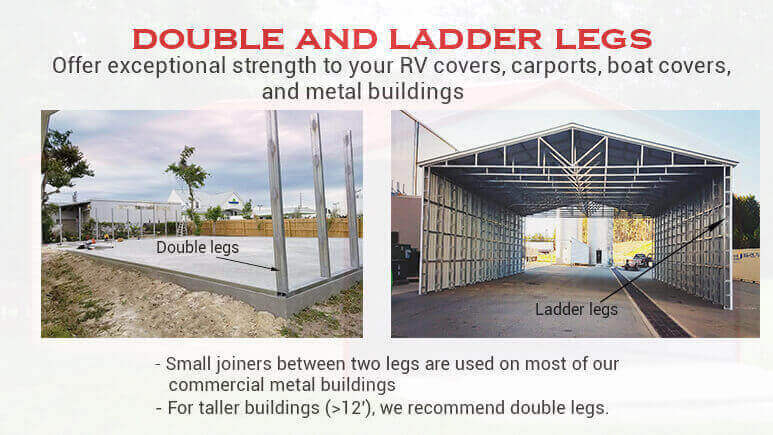 24×26 RV Cover Building Includes: 13′ Leg Height, 14 Gauge Frame, Vertical Roof Style, Double Legs & Double Baserails, One Center Brace on Every Bow, One Corner Brace on Every Leg, Concrete or Ground Anchors, Bows/Legs 5′ On Center, & One Panel with J-trim Down Each Side. The single panel on each side of your RV car port protects your RV/Motorhome from gusty winds, sun’s rays, and rain/hail. This standard 24′ x 26′ RV Carport can be customized to your exact needs. If you have a class A motorhome or if you need more center clearance for the overhead air conditioning unit of your RV, you can add more clearance by adding taller leg columns to this 24′ x 26′ Metal RV Cover. We design metal RV carports in 13′-16′ leg height and the width ranges from 18′ to 24′. A 16 feet tall Standard Metal RV Carport will have a center clearance of more than 18.5 feet which makes it suitable for any types of RV or special equipment storage usages. This 24′ x 26′ Vertical RV Carport has a 29 GA horizontal style sheet panel down each side with J-trim. You can also customize this metal RV Carport by adding more panels on the sides, closing a side completely or by adding a gable on the front or an extended gable on the back end. We can also build you a complete RV Garage with all sides closed and an opening for your RV. This will completely protect your RV from theft and from weather elements. This way you can be sure your belongings within the RV are secure and not prone to theft. This 24×26′ Vertical Style RV Carport can be upgraded and installed in any areas where the local codes exceed 140 mph wind gust or if you need 90 psf ground snow load. Order any Custom Steel Building from the ease of your home or office and choose from 13 different color options. Our metal RV roof, wall, and trim components can be customized with our many color options. To further set your custom RV Cover apart from the rest you can even add a wainscot on your building. The wainscot/two-tone increases the curb appeal of this metal structure giving it a premium look and feel. When your order is confirmed, you only pay 10% – 17% of the total cost of this Vertical Style Metal RV Carport. 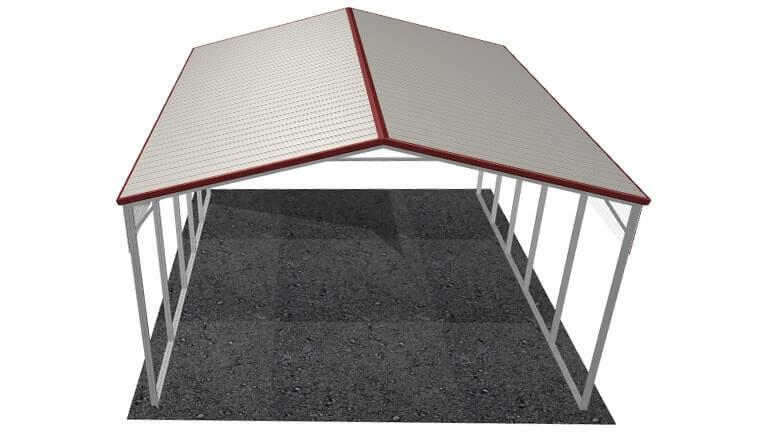 If you want a steel structure other than this 24′ x 26′ Vertical Style RV Carport, you can use our metal RV carport designer tool at:3D Carports and Building Configurator. While the above price is for the 24 x 26 Vertical Roof RV Carport is a non-certified unit in most of the states, some states include certification by default. Please contact us for exact certification. We also offer wind and snow certified units if your area requires them. Upgrading will either change the anchoring pattern of rebar and mobile home anchors and/or will add more anchors and braces to the structure to stand strong against higher winds and heavier snow loads. Other than this 24′ x 26′ Vertical Style RV Carport, we can design and build a full range of steel carports and metal buildings. We are metal building suppliers and our multi-purpose metal buildings can be used for outdoor storage, car parking, farming purposes, automotive or welding shops, RV garages, boat covers, hobby shops, commercial or industrial, manufacturing, animal shelters, warehouses, workshops etc. All our carports, garages, barns, utility carports, clear span metal buildings, storage sheds, and workshops structures are available in different sizes and with a wide range of customization options. For example, we make buildings 13-16 feet tall to shelter your RV and these buildings serve as motorhome sheds. For our commercial, industrial or retail customers, we have taller buildings with leg heights from17′-20′ feet tall.